Figure 1.3 Most Confederation-era Canadians were engaged in work that had not changed a great deal in hundreds of years. Harvesting Hay, Sussex, NB, by William G.R. Hind, ca. 1880. One month after the creation of the Dominion of Canada, the United States finally acted on its threats to annex territory to the north. Instead of some part or all of British North America (BNA), however, the Americans purchased Alaska. This was an audacious move. The idea of claiming territory that was thousands of kilometres away from the nearest American settlement, cut off by the presence in between of British North American territory, was a far cry from annexing contiguous lands. The same, of course, could be said for the Americans’ earlier wresting of California from Mexico. While much more of the American Empire was captured incrementally by squatters, settlers, and cavalry charges, the Alaskan purchase stands out for what it implies. That is, it was possible now for former colonies to administer sovereignty in remote lands. Canada watched and learned. Canada had its own imperial ambitions. George Brown — Toronto newspaperman, Clear Grit reformer, coalition government partner, and a Father of Confederation — made his support of the coalition and Confederation conditional on the purchase of Rupert’s Land from the Hudson Bay Company (HBC). The sale of the vast territory (encompassing the whole of the Prairie West from Hudson’s Bay to the Rockies and from the 49th parallel to the Arctic Ocean) went through in 1869, but the process was badly flawed. The Canadians (in Ottawa and on the ground in the Red River Colony) rushed matters and aggravated local sentiment. The Métis community around the confluence of the Assiniboine and Red Rivers wasn’t alone in its dissatisfaction with Ottawa, but their resistance and the Provisional Government became understood in the new Dominion as an act of hostility against a legitimate government by an illegitimate junta. The execution of Thomas Scott by the Provisional Government would embitter Canada against the Manitobans and the Métis for years to come (see Sections 2.5, 2.6, 2.7 and 2.8). All in all, the Dominion of Canada was off to a rather poor start. Provincial leaders in Nova Scotia and New Brunswick were able to muster widespread support for taking a second look at Confederation. The possibility of secession might be ruled out by Westminster, but as far as Halifax and Fredericton anti-Confederationist politicians were concerned this was a matter of popular consent and/or discontent. Federations, as the 1860s and ’70s would demonstrate, are difficult creatures. In this respect, the timing of the creation of the Dominion of Canada is important. It took place at a time when similar experiments were being launched or revised around the world. The most obvious case is that of the United States, where a century-old federation came apart along the Mason-Dixon Line. Although the South and the North were eventually re-united and re-federated, that change came about after years of a terrible civil war. Similarly, the 1860s saw a bloody campaign across the Italian States that completed the main work of the Risorgimento (the unification of Italy) by 1870. Less than a year later, the Franco-Prussian War, 1870-1871, produced a unified Germany under Prussian leadership. Federations — including the Canadian one — are generally understood to be consensual partnerships between sovereign or semi-sovereign jurisdictions. What these other federations/unifications and the suppression of the Red River Rebellion in Manitoba point out is that federal membership is occasionally helped along by the point of a bayonet. Why is that the case? Modern historians have wrestled with the meanings of Canadian confederation just as their Victorian contemporaries did. Was it an Act or a pact? That is, was it a reorganization of colonies stickhandled along and then imposed by Britain, or was it an agreement by (essentially) sovereign parties to share some of their authority with a new entity, the Federal Government? Were the provinces junior partners in the new federation or key stakeholders? This became a pressing matter (as we shall see) when Ottawa invoked its ability to kill any provincial legislation with which the central government did not agree. It persists as a pressing matter when one looks at the rhetoric of séparatisme in the late 20th century, a discourse that positions the province of Quebec as a partner with the ability to leave the table if and when it should decide to do so. Nova Scotians clearly held to the same belief in the late 1860s; they were persuaded to stay and not compelled by Westminster (let alone Ottawa) to stay. Another lens through which to view Confederation is as a means to colonial independence, an apparent contradiction in terms. Britain in the Age of Free Trade was eager to offload some of its colonial responsibilities and to normalize relations with the United States. Giving the British North Americans greater responsibilities and authority in their own domain was one way of doing that. However, the Americans recognized that Britain was still invested in North America and they were slow to recognize Canada’s own national authority. The ongoing fragmentary identity of Canadians is, thus, something that existed at the time of Confederation and has persisted. John A. Macdonald sought union but not necessarily unity, although it is difficult to speak of one without implying the other. George-Étienne Cartier’s vision was more along the lines of collaboration in a “duality” of French and English cultures. Outlying provinces — Nova Scotia and British Columbia, for example — were principally concerned with the economic advantages promised by Confederation. Many of the challenges that Canada would face in the century and a half that followed Confederation stem from its timing and a lack of consensus as to what it all meant. At the heart of the problem is the idea of the nation state. A nation is generally understood to be a culture or peoples, the main features of which include a shared language, ancestry, and perhaps a shared creed. A state is, more plainly, an administrative organization and a geopolitical realm. For Germany in 1871, the challenge was to inflate shared cultural features while downplaying sectarian differences, lingering loyalties felt in some regions to their neighbours (including France, Austria, and Switzerland), and the fact that some of the German states had been at one another’s throats for centuries. Old histories of difference had to be superseded by histories of sameness and mutual interest. Italy— a linguistic patchwork that at least shared a common Catholic heritage (however vexed relations might have been between Italy and the Papal States) — seized upon Dante as the father of the Italian language and, like Germany, sought to minimize historic rivalries between regions. A new iconography of the Italian state, with General Giuseppe Garibaldi at its spiritual centre and a new king in a shared capital, were key to creating an “Italian” nation state. Increasingly the United States would invoke the language of “nation” as well, most notably in its Pledge of Allegiance in 1892 in which the “nation” and the federal “state” become indistinguishable. Clearly some nation states in the late 19th century were less unified culturally than others. Canada’s odds in this respect were hardly worse than those of many other newly emergent countries. But it is worth noting that there was, at the time of Confederation, confusion about what constituted a nation state, a sense that expansion and territorial unification was a legitimate part of building a country, and that “nation building” involved more than a railway or two. The last half of the 19th century witnessed the organization and reorganization of several federal nation states. Scholars and politicians are divided on whether Confederation constitutes an Act imposed by Britain or an agreement between sovereign colonies. The concept of the “nation state” was still emergent and definitions were flexible. 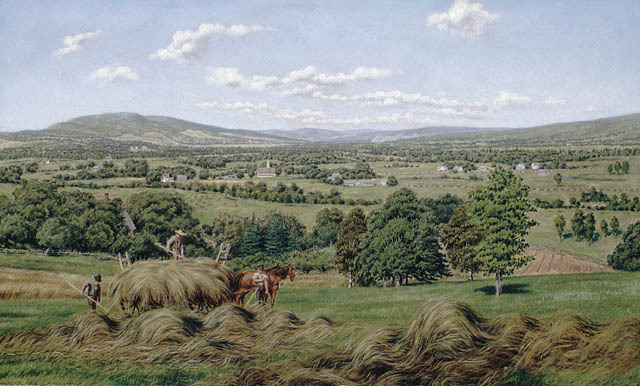 Harvesting Hay, Sussex, New Brunswick (Online MIKAN no.2835767) by Library and Archives Canada, Acc. No. 1982-204-9 is in the public domain. 1.3 The Age of Federation by John Douglas Belshaw is licensed under a Creative Commons Attribution 4.0 International License, except where otherwise noted.